The first meeting of Goin Groupies discussed, among many other recipes, her braised chicken that I had made just last weekend. Mz. Riz suggested that the recipe should be Sunday’s dinner. Then I made it again. 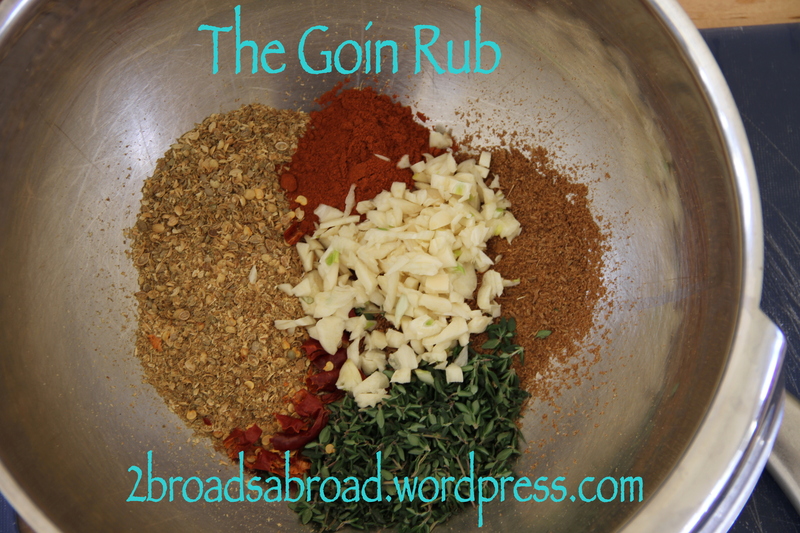 Let me tell you the flavors are rich and deep helped by cumin, coriander and Goin’s favorite chile de arbol. The preparation’s straight forward. The result is tender, melt in your mouth chicken floating on a bed of caramelized onions and fennel that are sweeter than dessert. 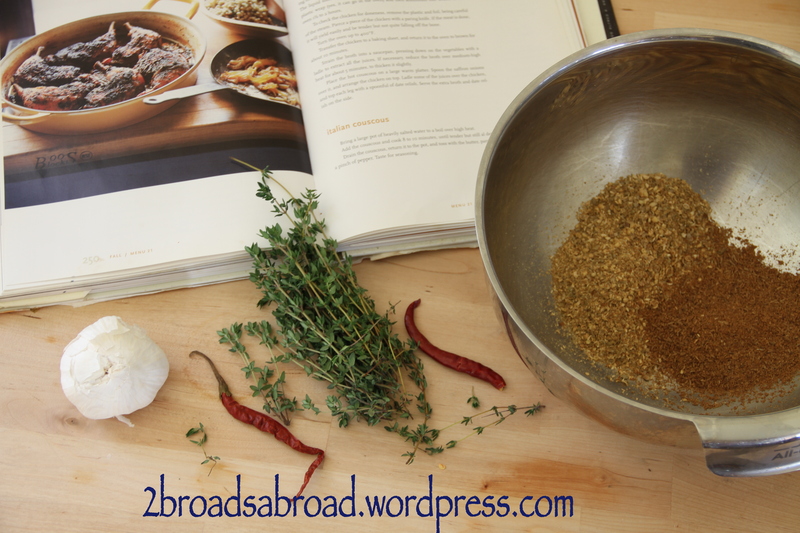 Place cumin, coriander, garlic, thyme, paprika, chile de arbol in large bowl and mix together. Add chicken pieces. Toss and really coat the chicken. Place in large plastic bag and refrigerate for at least four hours, best if overnight. Take chicken out of frig. Combine wine, sherry and balsamic. Measure the tomatoes. Heat a very large saute pan, let it get a little bit hotter. Add olive oil swirl and let it heat up until it dances a bit in the pan. Add chicken skin side down. Cook until golden brown. You might have to do this in two batches. 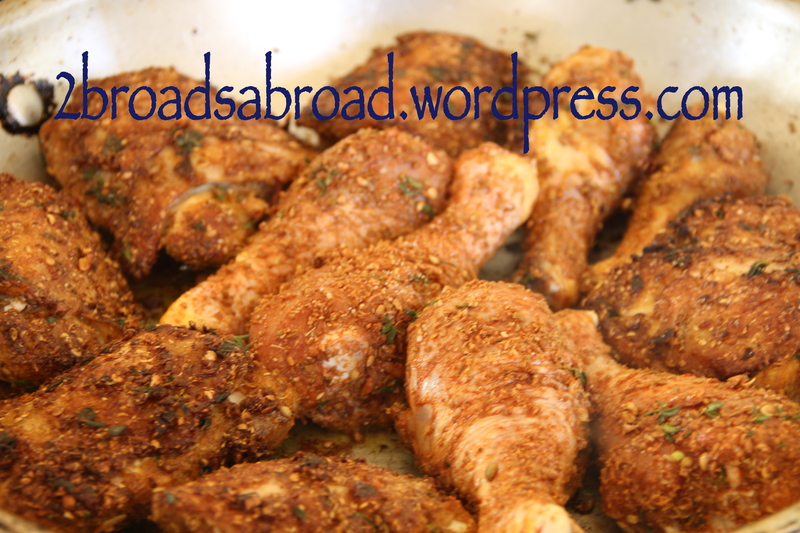 When chicken is golden brown on both sides place in braising dish/pan. If you have a lot of fat, pour some out until you have about 2 T of oil in pan. Turn the eat up and add onions and fennel. You want to caramelize the veggies. It will take 5-10 minutes. Add tomatoes and keep stirring getting all the goodness off the bottom of the pan. Add the vinegar/wine/sherry to the veggies and crank up the heat. Reduce liquid to half. Add 2 cups of chicken stock. Bring to boil. (Keep the rest of the chicken stock handy in case you need more for the braising pan. Pour the veggies into braising pan. Lift the pieces up so the veggies are on the bottom and the chicken is nestled by the veggies. If necessary heat up more chicken stock to raise the level of liquid. Cover the pan tightly with plastic wrap and foil. This is an old kitchen trick. The wrap doesn’t catch fire, it shrinks a bit but the foil doesn’t get eaten away by the acid from the tomatoes. Trust me, it’s safe. Mz. Riz doubted and is now a convert. Bake in 325 oven for 1 1/-2 hours or until tested and the meat just falls off the bone. Judy, Judy, Judy….let’s grab Kelli and go to a Suzanne Goin restaurant for dinner! Hi Judy, this looks delicious. Now I know what to do with the smoked paprika that I bought. Do you think I can make this without chiles so my kids will eat it? Should I just omit the chile or do you have any recommendations for adapting the recipe? Hi Dana, You could definitely omit the chile, I’d also cut the cumin and coriander in half. I doubled the amounts because it wasn’t zingy enough the first time. Bookmarked! Okay, this is a silly question, but do you prefer skin on or skin off? I made half and half because Mz. Riz simply hates skin. It worked well no matter if there’s skin or not.